I'm starting something new on my blog and that is reviewing coloring books! I've had a lot of requests to review them lately ever since "adult" coloring book popped onto the scene. I don't know about you but I absolutely love to color, even as a kid. It's always been such a fun and relaxing activity. 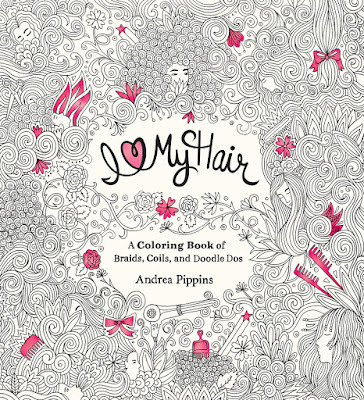 Today I will be reviewing, I love my Hair by Andrea Pippins. Let me first talk about the overall designs featured in the book. After receiving the book I went through it page by page checking out what types of things I would be coloring and I must say I was blown away by how remarkably gorgeous the art work truly is. There was so much detail and time that went into designing these pages. I can't begin to image how much work goes into designing one of these for others to enjoy coloring in. Author and Illustrator Andrea Pippins did such a beautiful job capturing the essence of beauty through the use of hair in all cultures and points in time, like the one above of Marie Antoinette. Take a look at this page with butterflies and flowers as hair. I used Prismacolor colored pencils to make use of shading and to add some contrast to make it stand out. The curves (lines) were easy to color in and heavy enough to be able to standout around the color. Just those few butterflies I colored took about 20 minutes because of the attention to detail. I love how unique this page is too. She looks like she is peeking out beneath her hair, but also blending into herself. Almost like she's hiding a secret only her hair butterflies know. The page below I colored with my best friend, Courtney. I colored the left side and she colored the right. This one was taking a lonngggg time to color. There are so many small spaces to color in that it took a while to each one. While although we did not finish, it looks stunning so far. Don't you think? Once again the usage of flowers is added to give it a special touch. Throughout the book, there is also a lot of words and sayings about hair and self-image. All of which are positive for young girls and adults, saying not only to love your hair you were born with but to love yourself. I used markers on this page. I was pleasantly surprised by how awesome the colors came out. Even more so I was happy to see the colors did not bleed through the pages. The book has nice and thick paper used with is great for coloring with markers, which can normally run through page onto the other side. Here is one I finished coloring. Yes, it's a mermaid. Her hair is luxuriously full of sea-life and seashells. I used colored pencils again for this page. I went with purple and blue for the base colors of her hair. Some light shading was scattered throughout. The attention to detail is outstanding. There's so much going on on this page but it all ties together beautifully to create this mysterious mermaid who rules the seas. I love my hair coloring book is full of richly designed art work but easy to color with your tool of choice. I preferred the colored pencils because I can shade with them but markers work perfectly too for a nice bright pop of color. I highly recommend this coloring book to everyone who enjoys coloring or for those who haven't colored since they were kids. It's a definite time killer and a great way to express your creativity. All of the pages are exquisitely illustrated with such detail right down to the smallest of curls to the largest of hair brushes. 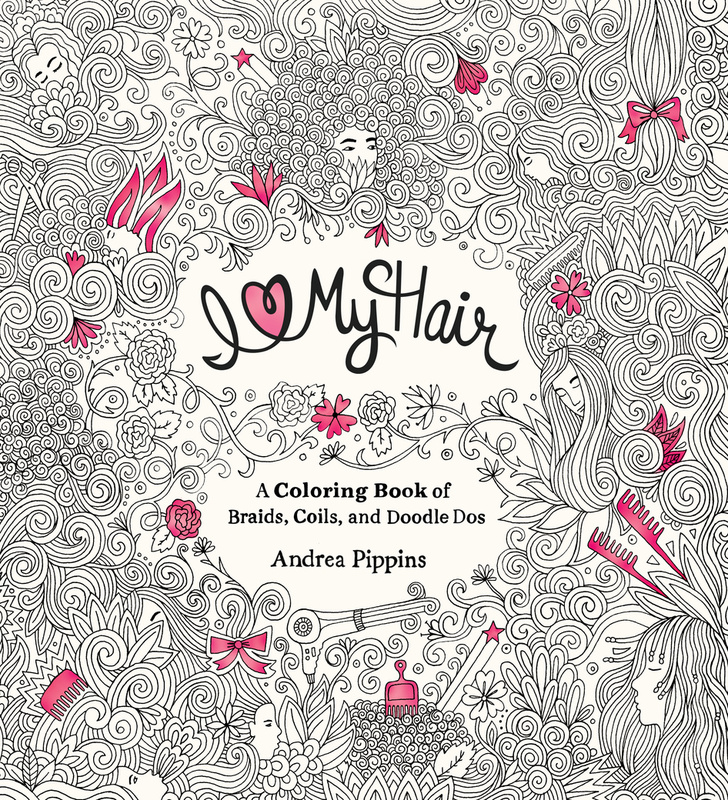 I had so much fun coloring in I Love My Hair and I think you will too! Let your imagination take you into a world of hairbow and clips, pigtails and perms, words of love and motivation, and of course HAIR!! Totally EPIC! One of the best coloring books I have colored in.